This is the ongoing story of Orchid Bizaar, scientist and intergalactic troublemaker extraordinaire, and those people she calls friends. Hers is a universe of great social complexity and cultural longevity. She and her brother are the youngest members of the Bender Society, a loose affiliation of intergalactic planet hoppers whose members hail from thirteen planets across the galaxy. Orchid Bizaar has not been tagged yet. 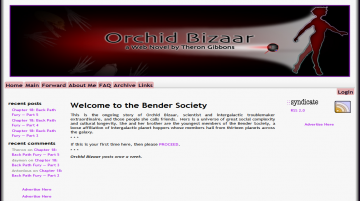 Help others find Orchid Bizaar by tagging it! Orchid Bizaar has not been reviewed yet. Orchid Bizaar has not been recommended yet.